It's a lead which can also be worn around your waist for hands free jogging with your dog or just re-adjust the handle loop for normal lead walking if you prefer. 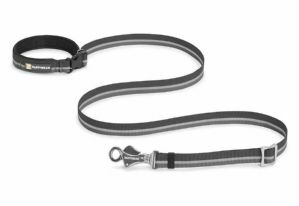 Very versatile 1.8m leash whose adjustable handle with clip means it can be taken by hand, worn around the waist when running with your dog or quickly unsnapped via its side release buckle & hitched around a post. A “traffic handle” loop near the collar attachment allows safe and easy close control of your dog. I have a dozen leads that I use with my dogs, however this one is easily my favourite. It is sturdy and appears strong enough to support te tugs of my dog. The Talon clasp at the bottom is very easy to manipulate but also is secure. Hands free jogging or running lead with detachable lead for normal walks.